My name is Goldie — after the gorgeous and talented Goldie Hawn, no doubt! I have a few talents of my own, you know. My best talent is snuggling up in your lap and making you fall in love! 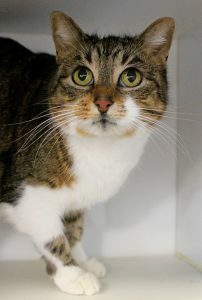 I’m a sweet and mellow 5-year-old girl with so much love to give. Although I was just a little shy when I first came into the shelter, I’ve adjusted really quickly and now I’m always eager to meet new people who stop by to give me scratches and pets. When someone comes up to meet me, I’ll look up at them with my gorgeous golden eyes and give a cute little “Meow”. I don’t even seem to mind the kids and dogs who walk by me every day! I have lived around other cats in the past, and probably could be okay around them again, however my favorite thing is to nap on a human lap and I think a mellow indoor home would be ideal for me. Are you interested in a gorgeous star like me? 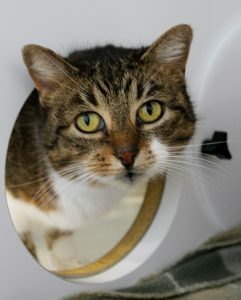 Stop by Pixie to say hello today! I come to you spayed, vaccinated, and micro-chipped for an adoption fee of $100.